Client Retention… PLEASE… Think Again! We know better. Actually, you do too. It doesn’t. Most companies have been surprised to lose clients that seemed to be satisfied and, of course, we all have kept clients that just seemed impossible to please. The numbers don’t correlate – they never have. Sure, a high level of client satisfaction is never a bad thing. Unless, it lulls you into a sense of complacency that a formal and disciplined account management process is somehow less important. Big mistake! We’ve spent the last 30 years challenging the management myths that simply don’t work in a managed services environment and replaced them with a “best in class” process that does – every time. Right now, the Clients for Life® Client Retention Process is protecting just over $23 billion worth of contracts for some of the largest and most successful service management companies in the world. These books are written for managers in the managed service industry and other companies that work with large service contracts where tenders and price competition are business as usual. The success of your organization is largely determined by the revenue and profit from your largest clients. For over 30 years, we have guided executives and managers from B2B service providers in improving commercial results from their key-accounts. When providing services under contract, nothing contributes more to profitable growth than client retention and improving the sustainability of profit streams from current accounts. Tenacity provides structured processes to excel in these areas. Worldwide, Tenacity’s clients have proven they can establish the highest retention rates in their markets. 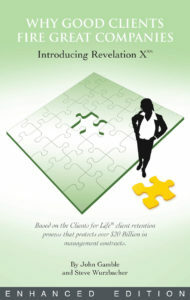 Currently, the Clients for Life Client Retention Process protects over $23 billion in client contracts with some of the largest and most successful service providers in the world. The future of an organization depends on its ability to continuously provide Relevant Value to clients. The Clients for Life Client Retention Process is a business process that maximizes your organizations capability to provide sustainable value for your clients. The Key Clients Benchmark helps service providers improve their profitability and market share. We recommend an enhanced focus on the 20% of your accounts generating 80% of your profits. Specific insights into their alignment with your overall strategies, the status of your account management initiatives and an assessment of their risk of defection, could prove invaluable. One thing that has become clear in our over 30 years experience, is that the current results are always the consequence of management's vision, strategy and execution. We welcome the opportunity to create a dialogue with senior management to ensure these elements are leading to maximum, sustainable profitability. Tenacity's Account Management training program provides online access and digital certification in the proven best practices of key account management. 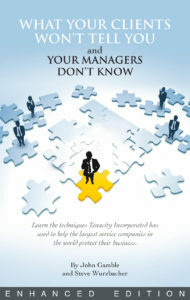 It is scalable, self-paced and builds valuable and practical skills for key account managers. Client satisfaction surveys are of limited value and are not predictive of client retention. Tenacity consultants meet in-person with your existing clients to gain actionable insight on the risk of defection, the strengthening of relationships and the delivery of Relevant Value. Stop client defections before they happen. Those who don't learn are destined to repeat the same mistakes! A PostMortem Audit® is a forensic qualitative in-person meeting with the former client and a Tenacity consultant. We help you understand the hierarchy of reasons for lost contracts or sales proposals and prevent recurrence. One of the risks for any company is that when things are going well and no one is complaining, it's too easy to allow yourself to get focused on something else. This type of client intervention refocuses us back on clients. That is the absolute best thing you can have happen in the marketplace… because they will help you sell new clients. [This process] has caught the attention of several major firms in the outsourcing industry. In this age, the idea of a process or system that results in clients who continue for years and years is captivating. We were Tenacity's first client. For over twenty-five years their processes have allowed us to gain insights into our client's expectations and perceptions that we wouldn't have gotten otherwise. We consider them an invaluable resource and intend to remain a client for life. As an added note -- in my close to 30 years of business leadership, I have been involved with many customer retention initiatives. This is, without doubt, not only the best, but quite literally the only effective end to end approach I have ever seen. The client retention process forms the bedrock of our account management process. It’s been a critical component in establishing a culture puts customers first and has resulted in the industry’s best customer retention rate.